INDIANAPOLIS — Las Vegas based casino operator Full House Resorts has proposed moving half of the 1,400 gaming tables and slot machines from Rising Sun Casino Resort to a new $650 million upscale retail center achored by a casino it wants to build on surplus parking lots near the old Indianapolis International Airport terminal. The proposal is the first serious attempt to bring gambling to Indiana’s capital city in years. The last serious proposal for an Indianapolis casino came almost a decade ago, under then-Mayor Bart Peterson. Before that, a casino and racetrack had been proposed at the state fairgrounds nearly 20 years ago. Full House Resorts submitted the proposal Monday, Aug. 10, which was the deadline for proposals for the site. The Airport Authority had been accepting bids for development of the razed terminal and nearby parking lots that are no longer needed. The moving of gaming tables from one county to another would require approval by the Indiana legislature. In the past, lawmakers have been wary of expanding casino gambling to Indianapolis. Two horse tracks with live betting and in-house casinos operate near Indianapolis, in Anderson and Shelbyville. Those casinos lobbied to add live dealers to their gaming tables this year, but legislators ruled the change wouldn’t be allowed until 2021. Full House Resorts, which recently changed management, said it’s barely breaking even at the Rising Sun Casino Resort on the Indiana side of the Ohio River. Several other casinos have opened nearby in Ohio since 2013, cutting into its business. Revenues have dropped by 75 percent to $40 million a year since the Ohio competition opened its doors, according to Dan Lee, CEO of Full House. The proposal for the Indianapolis casino is an effort to save the Rising Sun. 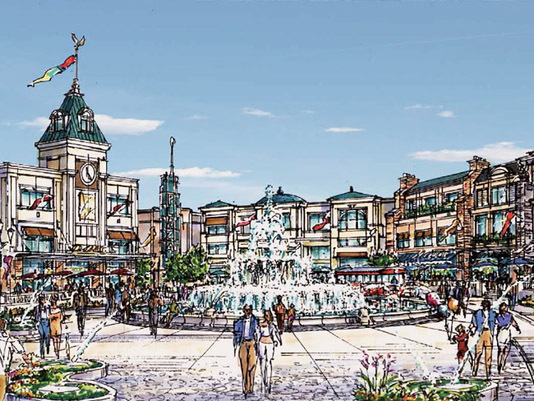 The center would also include a theater, office space and 200 condominiums. The company estimates it would generate $85 million a year in state and local tax revenues when fully open and create 4,000 new jobs. The proposal is called “American Place.” It would be situated on 135 acres that had primarily been used for a parking lot at the old airport terminal. The project would take three to five years to build. Full House is not asking for any economic incentives from the state or city. Governor Mike Pence has said he opposes the expansion of gambling in Indiana, but it is unclear whether Full House’s proposal would qualify as expansion.